The chapter uses an empirical study of the introduction of performance-based funding in German medical departments to argue that academics might not lose their autonomy within the institutional structure of their departments. This finding is contrary to theoretical claims that recent university reforms have taken autonomy from academics and given it to university administrators. Document analyses and 22 key informant interviews were conducted and showed that senior members of the departments examined were often even able to increase their autonomy in comparison to more recently tenured academics, who indeed seem to be more affected by reforms. At the same time, university administrators have gained some autonomy and authority within German medical departments. 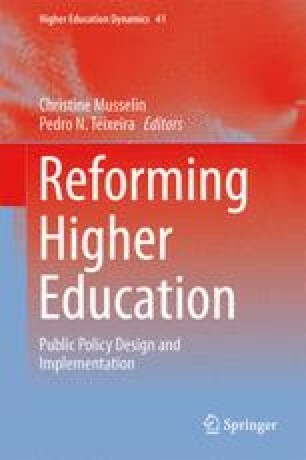 The findings suggest that the distribution of autonomy through new public management inspired governance reforms at universities is not a zero-sum game, and certain win-win situations are possible – especially when factors such as reputation and seniority are taken into account. The project GOMED is financed by the Federal Ministry of Education and Research (BMBF) under the research initiative “New Governance of Science.” I gratefully acknowledge the cooperation of my colleagues Dr René Krempkow and Joerg Neufeld from the Institute for Research Information and Quality Assurance (iFQ), as well as the feedback of the science policy research group at the Social Science Research Center Berlin and Uta Landrock (also iFQ). I am also indebted to Jeff Purchla for his advice and support.